I didn't know you were going to be posting this and my gun will come in just about the time for my 1 year BBAGA. Let's see, that gives me a little under 5 months to save up for that gun I've been wanting. The only choice is which wish-gun to put at the top of that long list. Maybe we need a sidebar logo? Any of you good at that sort of thing? I could probably whip something out, once I get to my home computer tonight and Photoshop. What do you want it to look like? Graphic design is definitely not my strong point! I'd thing it should have a gun on it (duh! ), maybe some red, white, and blue, since we live where we have the freedom to BUY guns? Let's throw it open for suggestions? What should the sidebar graphic look like? If we get more than one sent in I'll post them and we can have a vote, or something? I like that you used the Uberti I bought for myself this spring. Nice. OG: I couldn't remember for the life of me where I originally found that picture, but it sure is a beauty! I spent so much $$$ buying gifts for the grandkids, I plumb forgot to leave enough to buy myself a gun. Looks like I picked the wrong day to stop sniffing glue . . . I've been trying for every one month anniversary, but my wife won't let me! Speaking of (Blogger) Buy a Gun day, has anyone seen what happened at Aarons.cc - the BAG Day 'originator's site?? It looks like a WordPress initial screen under a Farsi banner. Major bummer before 4/15. 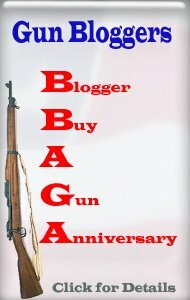 I think I'll declare my blogversary on April 15 so I can hit two targets with one shot. Hey wait-a-minnit, then I'll only be able buy one. Never mind. I'm back and soon I'll vent my wrath on the camel-humpers who denied me my rightful annual pre-BAG Day blogging! Heeee heee, Mine will be here this week! 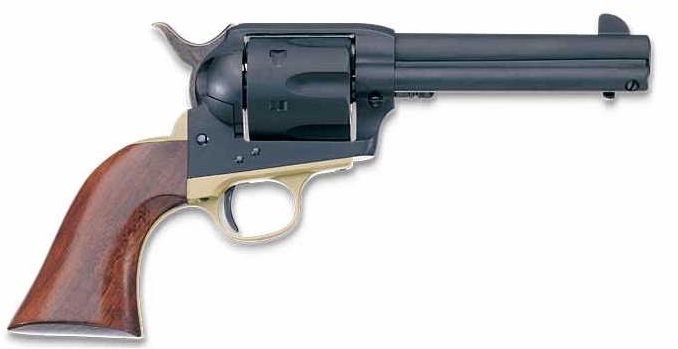 I live in California and want to purchase a hand gun. I'm willing to go to Reno, NV where I understand it's much easier to buy a gun. Anyone out there know where I might go. I've heard the Palace Pawn shop is a good place.